This long series is approaching its finale. Eventually there will be 25 volumes and this is 23. 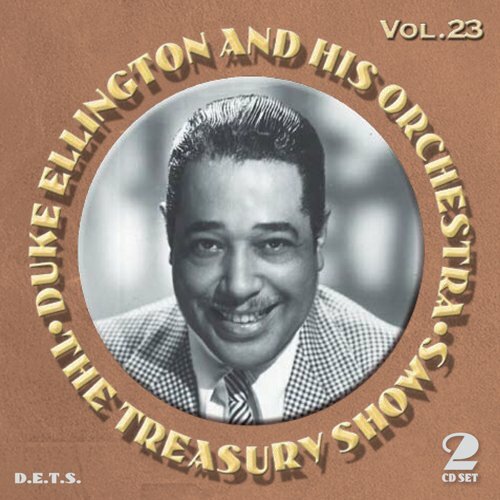 Volume 23 The Treasury Shows show us the working Ellington band during the mid-forties. Some argue that this is one of the best periods. The broadcasts show a more relaxed side as the band settle into its less tense routines. They were not really recording, just playing. No red lights. There can also be some sloppiness in the playing as the band travels round the country. Nevertheless, the band was packed with great artists all with their own unique styles and tones. It should never have coalesced into a coherent musical entity but it did more than that. The first five songs on CD 1 have Duke Ellington from 1946 playing solo performances on ‘Mood Indigo’, ‘Don’t Get Around Much Anymore’ and ‘Sophisticated Lady’ while Oscar Pettiford brings his bass for a duet on ‘Solitude’. The rest of the CD is from Culver City in 1946. The discipline of the radio means that most of the tracks and therefore the solos are kept short. There are the usual repertory items and then rarely played pieces like ‘The Suburbanite’ and ‘Solid Old Man, and ‘Hollywood Hangover’. The Treasury tracks are usually free from distortion but ‘What Am I Here For?’ has serious distortion at the beginning of the track. The irritating part of all the discs is the relentless promotion of the saving bonds. I suppose Ellington thought that the income from these broadcasts helped him to pay salaries. The second disc has a tribute to WC Handy with ‘St Louis Blues’, ’Memphis Blues’, ‘Beale Street Blues’. Other highlights are a sensitive solo by Johnny Hodges on ‘Warm Valley’ complete with that languorous tone. Interesting to muse on how he changed over the next twenty years, not quite as much sentimentality. Sadly, Joe Nanton died a few weeks before this broadcast and most of the trombone solos are by the urbane Lawrence Brown. (Nanton is listed incorrectly in the personnel in the notes). Oscar Pettiford and Sonny Greer are given time to reconnoitre ‘Jumpin’ Punkins’. Pettiford is probably the best Ellington bass player after Jimmy Blanton and gives the rhythm a solid base. Eccentric drummer Greer already sounds slightly dated. Nevertheless, this one of the best tracks with the band at its fluid best. The energy and the fierceness of the brass with Taft Jordan and Ray Nance on ‘Three Cent Stomp’ is impressive. Cat Anderson sees out ‘Blues on the Double’ with high notes. Over and under everything is the piano playing of Ellington as idiosyncratic as ever.